Bagnall, a history major, combines his two passions, history and comedy, in this satirical history myth/fact book. 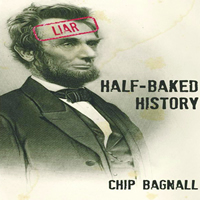 The 85-page book features a collection of 37 historical events that span a variety of time periods and geographical locations, and are reinterpreted by the author posing as the esteemed Professor Chip Bagnall in ways that are random, witty, and at times, vulgar. ISBN-13: 978-1466335196. Published by CreateSpace, 2011.